(All Photos courtesy of Layn Mudder of LPT Images.) Dacotah Speedway in the past few years has really been growing - in types of shows, number of shows, number of fans, and number of cars. We scheduled 15 nights and ran 13 of those nights, with only 2 weather cancellations. Along with that, we ran a tractor pull, a mud drag, 2 demolition derbies, and a 2 day monster truck show. We gained more fans per night than the previous year and that is the largest jump in fans in over 10 years. The one thing that really has gotten people talking is cars, cars, and more cars! So many cars that a lot of nights both of our pit areas were full - 121 cars per night on average showed up for our weekly shows! That is the first “first” we have: from what we can tell, no other track in the region had that many cars each week! 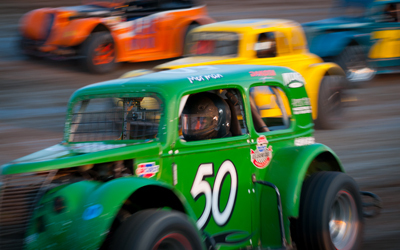 When you buy a ticket to a race at Dacotah Speedway you will get more than that ticket’s value of excitement and entertainment. The next “first” we’ll touch on is our Wissota Street Stock count. 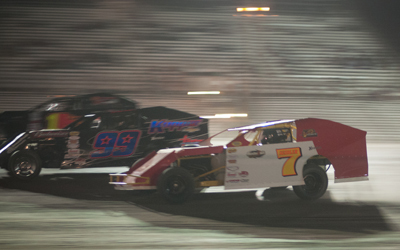 Street Stocks are one of the fan favorites, with some of the closest and most exciting divisions. We had 24.9 of these cars each night, and at the Wissota Promoter's Association Banquet/Annual meeting we were recognized as the largest Street Stock car count in all of ''Wissota Territory''! 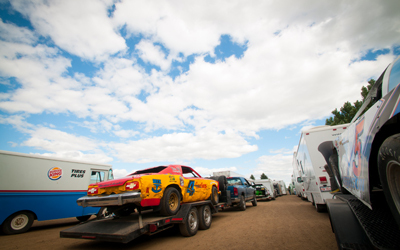 Pulling cars from all over North Dakota, these drivers put on shows like no one else in Wissota Territory has seen. People ask “How did you g et that many cars per night?” and there are many factors. We have a group of 4 or 5 guys that are led by our blade operator to work the track surface each week. Harold Rooker and his crew put in over 40 hours of work some weeks preparing the track for Friday's race. That’s on top of their regular jobs. 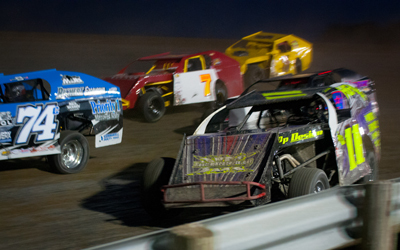 This smooth race surface makes for some high speed, 3 and 4 wide racing. Cars come to the track and for the most part rarely ever have to be loaded with a tow truck. We have fair payouts that are competitive with other tracks in the region; some say we pay too much, others say too little, but looking at what other tracks do, we are right there with the rest. Another thing that brings drivers to our track is the competition. We have on weekly ba sis drivers who have won multiple track and touring series championships, and have also placed in the top finishing positions of their respective divisions. For example, look at all the championships: Mark Dahl in the flaming #1, Marlyn Seidler in the white and red #7, and Shawn Strand in the jet black #99 car have won and they have done it all racing door to door with each other! 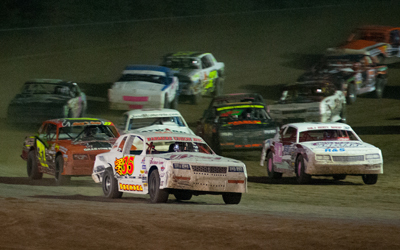 The Street Stocks are the same way; drivers have been all over Wissota Territory to see how they match up to other drivers. They come back here to compete with home town drivers who give them a run for their money every Friday night. Legend car drivers points are split up into different classes/divisions and we had drivers here at Dacotah Speedway placing in the top 10 in each division! In the Young Lions division, Dauntee Martin placed 9th; in the Semi-pro division Troy Hoff placed 3rd in points; in the Pro division Steven Kuntz placed 3rd, with Donovin Weist in 4th, Paul Huettl in 6th and Drew Papke in 8th. Finally in the Master's division Shane Williams took first - he put on the miles traveling to many tracks to compete with the best of the best. All of these drivers competed in separate division for national points, but in Mandan they battled it out right next to each other for track points. As you can see, a little known track that had a quiet beginning back in 1990 is making a lot of noise today by being number 1!